The 35th America’s Cup is well underway. This prestigious sporting event, which was first run in 1851, has the world’s oldest sporting trophy (the Sterling silver “Auld Mug” made by Garrard of London). It is often called the Formula 1 of the seas because the boats are about as high-tech as they come today . . . and seem just as fast. As of this writing in September 2016, the America’s Cup is nearing the end of its preliminary Louis Vuitton World Series with only one race left to take place in Fukuoka, Japan in November 2016. 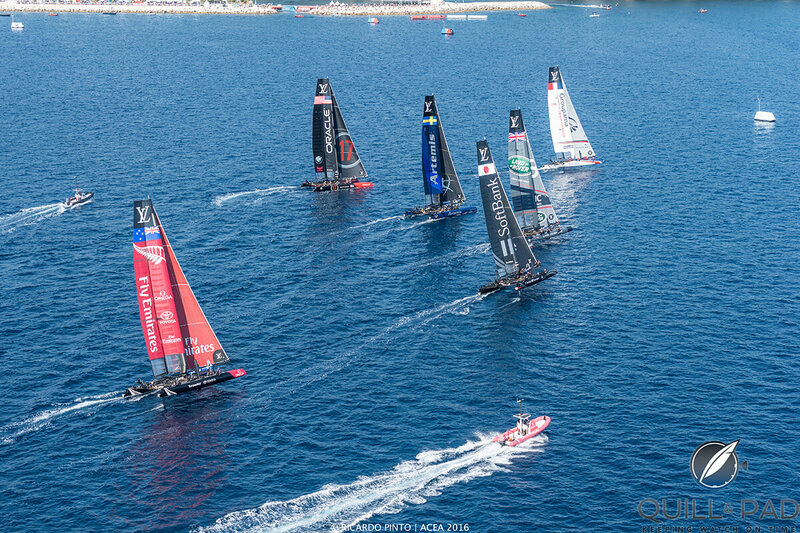 The points-based Louis Vuitton World Series races determines the ranking position of the challengers – Artemis Racing (Sweden), Emirates Team New Zealand, Land Rover Ben Ainslie Racing (Great Britain), Groupama Team France, and SoftBank Team Japan – as they go into the America’s Cup Qualifiers. The Qualifiers determine who will race one-on-one against Oracle Team USA, the winner of the last America’s Cup. It’s up to Oracle Team USA to defend its title in 2017 when the America’s Cup takes place in Bermuda. The U.S. team will go up against the winner of a previous double set of round robins known as the Qualifiers to be held in 2017 in Bermuda. Bremont is the timing partner for defending champion Oracle Team USA, and as such is also the timing partner for the whole America’s Cup since Oracle as the returning champion is also the organizer of the event. 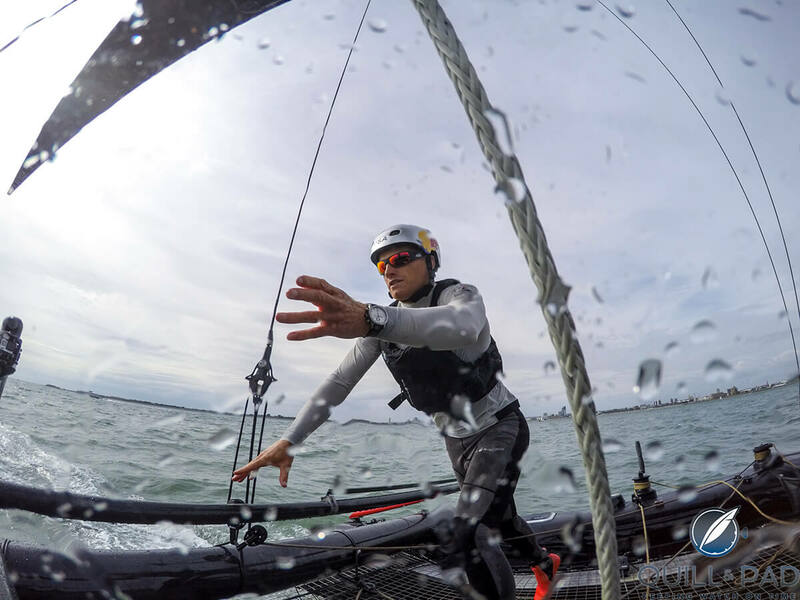 Omega is partnered with Emirates Team New Zealand, while Ulysse Nardin has entered the very first marketing sponsorship in its history with Artemis Racing (see Ulysse Nardin’s First Sponsorship: Artemis Racing, Iain Percy, And The America’s Cup). For a rundown of the recent past of the America’s Cup and how it relates to watch brand marketing, see Understanding The America’s Cup’s Fascination With Time. Bremont kindly invited me to spend the Louis Vuitton America’s Cup World Series race weekend with co-founder Giles English and other invited guests in Toulon. We could hardly have gotten a better weekend for it: under the brilliant blue skies and intense sun of France’s Côte d’Azur light, shifty winds saw races taking place against the gorgeous backdrop of the French Riviera’s Mourillon Beach, where the race village was erected – even though that wind made the teams’ tacticians and helmsmen sweat for every point. The Toulon weekend’s racing was won by the Artemis team, who impressively won three of the six weekend races. The Land Rover Ben Ainslie Racing team led the series going into the weekend, and even though Oracle Team USA fought hard, managing to pull even by the end of Saturday, the British racers are still ahead by a nose. The Japanese race, however, could shift things again. It remains exciting as the scores below show. Oracle Team USA was founded in the year 2000 by Larry Ellison, the co-founder of Oracle Corporation. A challenger in 2003 and 2007 representing the Golden Gate Yacht Club of San Francisco, it went on to win the 33rd America’s Cup in 2010 by beating the headline-grabbing Swiss defender Alinghi in Valencia. This returned the coveted “Auld Mug” to the United States for the first time since 1995. And Australian Jimmy Spithill, 30 years old at the time, became the youngest skipper ever to win the cup. As the reigning champion (known in sailing parlance as the “defender”), Oracle Team USA dictated the technical specifications of the boats to be sailed in the 2013 event: the AC72 was a carbon-fiber hydrofoiling catamaran weighing nearly six tons, with a 41 meter (135 foot) rigid wingsail capable of speeds beyond 45 knots. It requires eleven crewmen to tame the enormous power that these boats generate. Only a 44-second lead separated Oracle Team USA from Emirates Team New Zealand, allowing it to win the 2013 America’s Cup. Now at home in its Bermuda base, the newest boat – the AC50 – will be introduced to the public in early 2017, just a few months before the finals of the next America’s Cup. Can the team achieve a hat trick? “It’s about putting yourself second and really thinking about the team and your teammates. We’re pretty fortunate that we’ve got great people, and that’s what wins the America’s Cup,” says Spithill, an Olympic gold medalist. I had the great fortune to wear one of the new watches Bremont created in honor of the brand’s affiliation with the America’s Cup throughout the weekend, the Regatta AC. This timepiece was developed through conversations between Bremont’s designers and engineers and the Oracle Team USA sailors, who stressed the importance of functionality – in particular countdown functionality, which is needed at the beginning of every race. Bremont fastidiously worked with its Swiss movement partner La Joux-Perret to develop the Regatta’s caliber, which incorporates a unique countdown chronograph movement. Pushing the chronograph button starts the five-minute countdown, expressed as color filling semi-circular cutaways at 12 o’clock. I really enjoyed the ease of using the robust, reliable movement with its attractive rotor proudly exclaiming its purposeful participation of the America’s Cup through its charming engraving. And not only is the coloring of the watch’s countdown element unique and functional, it is also extremely attractive. I particularly like the use of red, white, and blue as the central color scheme – these three colors simultaneously represent both the British and American flags as well as the racing colors of Oracle Team USA. And speaking of the dial, I also continue to admire the word “London” used in place of “Swiss Made” or “British Made”; it just looks and feels classy to me. One note: the blued hands seen here may change slightly in the final serial form of this watch; its designer Giles English wasn’t quite done deciding if they needed a splash of Super-LumiNova. The robust Trip-Tick case – a Bremont-style three-part case, the name of which is a play on the word “triptych” – with its attractive case band coated in DLC was easy to wear, particularly paired with the extremely comfortable navy blue rubber strap. The Regatta AC’s case shape is based on the Bremont ALT1-C model line, which is water-resistant to 100 meters. The polished stainless steel is hardened. For more information, please visit www.bremont.com/collection/americascup, www.americascup.com/en/louisvuitton-americascup-worldseries, and www.americascup.com.